It occurred to me that I haven't blogged about my new friend! I mentioned her on my Facebook Page, but I never posted about her here on my blog. 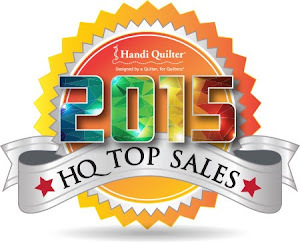 This is my new HQ Avante. I've quilt three quilts on her so far. One I can't show you yet, I'm boxing that one up and shipping it off for photography for a magazine publication, but these two are for me. This one is my High Cotton that I made with swapped blocks with Starlyn and Mary. It's going to be my new throw quilt on my comfy chair ~ I love making quilts just for me. It's so nice to be able to bring these quilts to a finish so easily, thanks to my new friend! Well, we recently did some re-evaluation of my sewing spaces, mainly because of the machinery that I've been adding lately ~ and we came to the conclusion that instead of using several small rooms upstairs, It'd be better to move all of my sewing apparatus to one space in the basement. So this is my new "Quilt Cave" ~ I gave up some nice views out the windows upstairs, but I'm loving my new space down here. Some of the furniture like the roll top desk on the right, and the big wooden file cabinet in the previous picture, were already down here, so instead of finding them a new home somewhere else, I just incorporated them in...after all, they're heavy and we were getting tired! I only have the one closet down here which goes under the stairs (upper left side of this photo), so there's a lot of big not so attractive stuff like bags of batting, stuffing, extra totes, and bins of misc. stuff in there. Some of the things on the walls are hung in odd places because there was already a nail there from my son's stuff, I'll probably tweek some of that later and patch some holes. There were a couple of easy chairs down here already, so I kept this one here for reading/knitting. Backing up to the other side of the room, behind the desk, I was even able to bring down my yarn and knitting stuff ~ previously this was in baskets and containers dotted all over the house (In fact I keep finding more). This divider creates a nice little nook for my HQ Sweet 16 to sit between the yarn bookcase, and the black wardrobe in the next picture. It may be a few days before I have finished pictures with the Avante in place because life is getting in my way ~ I have to work today, and I have a Baltimore Applique Society Board & General Meeting tonight...but on the bright side, my patience is getting a good testing! Congratulations to the two winners of my 100 Blocks Blog Hop Day last week! 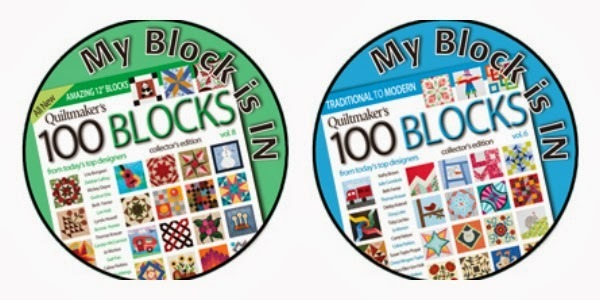 Maureen will win a Free copy of 100 Blocks magazine from Quiltmaker. Her comment said... I love your block! And congratulations on being chosen for this edition! Thanks for a chance at the give-away! great block! you could use all kinds of fabrics with this one. 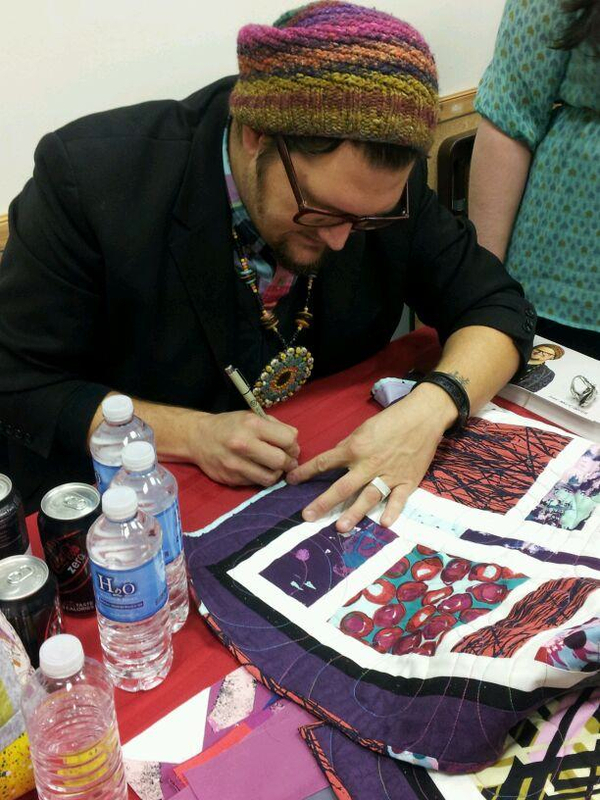 Jay McCarroll came and spoke to our Baltimore Modern Quilt Guild on Sunday. He was the Season One winner of Project Runway, and a very creative designer. A group of us from the guild had run into him (literally) at the Lancaster quilt show back in March, and spoke to him about coming to visit us in Baltimore ~ This Blog Post at the Baltimore Modern Blog tells about our adventure that day. Amendment VIIn all criminal prosecutions, the accused shall enjoy the right to a speedy and public trial, by an impartial jury of the State and district wherein the crime shall have been committed, which district shall have been previously ascertained by law, and to be informed of the nature and cause of the accusation; to be confronted with the witnesses against him; to have compulsory process for obtaining witnesses in his favor, and to have the Assistance of Counsel for his defense. 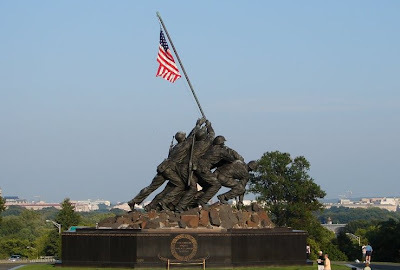 Say thank you to a Veteran or someone currently serving, and enjoy your freedoms today! 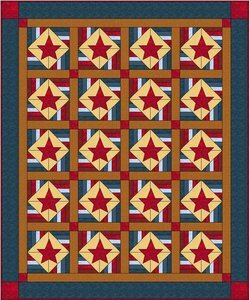 If you're interested in making a Quilts of Valor donation quilt to comfort a wounded war fighter, visit the Spring Water Designs Free Pattern page to download the free pattern for the Stars & Bars quilt. 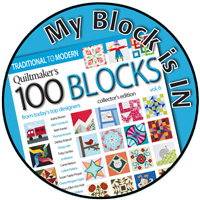 I'm so excited to share that I have a block in Quiltmaker's 100 Blocks Volume 6! I've never been in this publication, so I was so flattered to be invited to submit a block, and to have it accepted! This is the latest issue in the Quiltmaker's 100 Blocks series and should be hitting news stands on November 14th. (You can pre-order copies Here). This is my little block ~ It's called Sunrise (It's block #598). This version is made with the Kate's Garden fabric line designed by Kate Knight for Quilting Treasures fabric company. Here is an easy design layout idea using nine blocks, and setting them together in three rows of three. I like the "motion" that setting these blocks together creates. You get a kind of pinwheel secondary block by setting them together. ...And here is the same setting just with adding sashings between the blocks ~ bright and fun :) Come back tomorrow, and I'll show you the same block in another colorway! 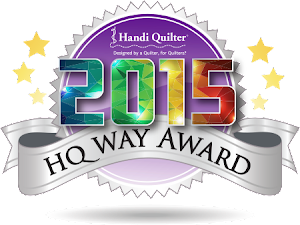 Until then, leave a comment on this post for a chance to win your own copy of Quiltmaker's 100 Blocks Vol. 6! 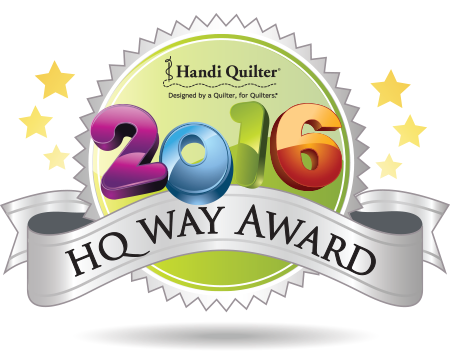 I'll be picking two winners on Sunday, November 11th ~ one winner will receive an issue of the magazine from Quiltmaker, and one winner will receive a Spring Water Designs pattern pack from me :) Visit our Spring Water Designs Website to see our current line of patterns. 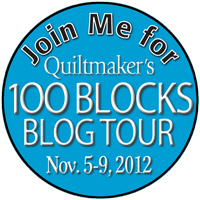 And be sure to follow the 100 Blocks Blog Tour daily November 5 - 9th at The Quiltmaker Blog Quilty Pleasures for some wonderful inspiration from designers and lots of giveaways! This little lady joined my growing sewing machine family a couple weeks ago. (My house is actually starting to look like an old sewing machine rescue center). So today her and I stitched up my row for this month's Row Robin for the Baltimore Modern Quilt Guild. ...And I'm smiling as I'm ironing on this new ironing station that my hubby made from an old bookcase that I had in the basement to go in my new sewing space down there. 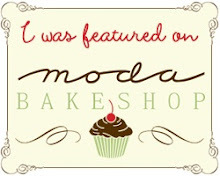 Fun News & A Blog Hop! 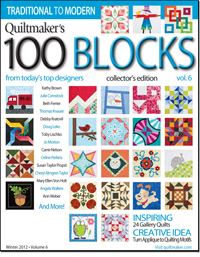 I'm so pleased and honored that I have a block in the next issue of Quiltmaker's 100 Blocks Vol. 6 magazine! 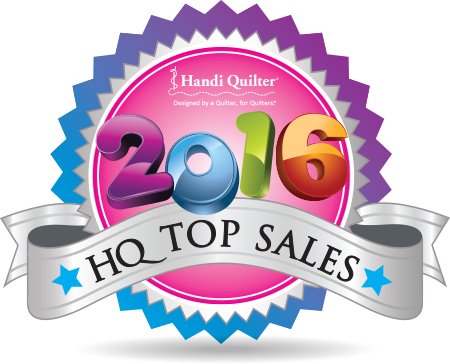 It'll be on the new stands soon, and this week in anticipation, Quiltmaker is having a Blog Hop...Starting Today!